Panelist fielded questions from the audience while cautioning that doing business would require "patience...patience." 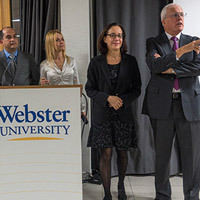 A recent panel on "Doing Business in Cuba" at Webster University's Geneva campus helped answer how political and trade developments and the reestablishment of full diplomatic relations with the United States may change the ability to invest in Cuba. Organized by members of Webster's George Herbert Walker School of Business & Technology, the event was moderated by Michael Parmly, head of the U.S. mission in Havana for three years. The panelists have foreign business and local business experience in Cuba. Among them were French businessman Eric Peyre, head of sales and marketing for Accor hotels in Cuba, and Miguel (Mikey) Morales, a Cuban entrepreneur who left his job as a waiter to develop a family restaurant and who later developed a high-level training program in the hospitality area for Cubans. Panelists agreed that doing business in Cuba requires “patience… patience… patience" -- in particular when working under government scrutiny -- but that there are opportunities for investment and paths to do so. Read more and see photos from the event at Webster Geneva.